Roasted garlic adds a rich, deep flavor to savory dishes. The most common way for roasting garlic is to wrap whole heads of garlic, with the tops cut off, wrapped in aluminum foil and drizzled with olive oil. My method focuses on roasting garlic cloves peeled. Learn how to roast garlic with these step-by-step instructions. 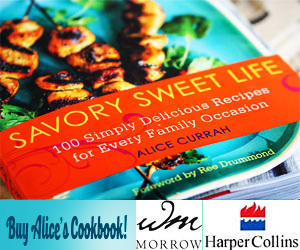 Find the roasted garlic recipe here at Savory Sweet Life at the bottom of this post. Raw garlic has a sharp, distinctive bite to it when tasting. When sauteed, the yummy garlic flavor adds a delicious flavor to many dishes. However, when you roast garlic, its rich, deep mellow flavor is sweeter and velvet smooth. Anytime you want to add a rich, subtle garlic flavor into a dish; roasted garlic is the way to go without it being overpowering. Ideal for blending into sauces like alfredo or pureed into condiments such as dips and hummus, roasted garlic is perfect for when you want a subtle garlic taste without the unpleasant bite, like for roasted garlic mashed potatoes. When I was 21 years old, I experienced the sublime joy of eating roasted garlic right out of the oven for the first time. After the restaurant I worked in closed for the evening, one of the chefs offered me a taste of the roasted garlic he made in the oven. Still warm and wrapped in aluminum foil, he gently squeezed the roasted garlic clove out of its peel and into my hand. I put it in my mouth expecting the garlic to be spicy. Instead, whoa! Not spicy at all but oh so smooth. Who knew roasting garlic in the oven would make it taste so soft and sweet? Subtle and delightful! I wanted so badly to ask Chef how to roast garlic but felt like an idiot because it seemed like this was something everyone probably knew how to do. Everyone but me. Learning how to roast garlic in the oven is easy after you do it once. Some recipes call for roasting the whole bulb of garlic by cutting the tops of the garlic off and drizzling with teaspoons of olive oil on the cut side. My roasted garlic recipe calls for roasting lots of pre-peeled individual cloves of garlic all at once on a baking sheet. Having grown up with very little, I had limited experiences with a wide variety of foods, even the most basic kinds which were very simple. I always would get excited when I tried something new. Sometimes people wrongly assume the most basic recipes like this one on ‘how to roast garlic’ is common knowledge. But to me, tasting then learning, how to roast garlic in the oven was a joy which has stayed with me since. This straightforward recipe for roasting garlic in the oven takes whole peeled cloves coated in olive oil, and cooking it in the oven until soft, golden, and slightly caramelized. Stored in olive oil, roasted garlic cloves can be added to any of your savory dishes including mashed potatoes or creamed with butter. Or if you are like me, you can spread it on a piece of warm French bread. This recipe is perfect for anyone who buys large quantities of peeled garlic, like from Costco, and needs to use them up quickly before they go bad. There are so many ways to enjoy roasted garlic. By roasting the garlic cloves in a large quantity, you’ll have all the magic of roasted garlic when you need it. It’s also worth mentioning; you can freeze individual roasted garlic cloves as indicated on the recipe card. The olive oil you preserve the garlic cloves in will also benefit from the infused garlic flavor, which is great when you want to cook with garlic oil. The roasted garlic should be stored in the refrigerator and will last for two weeks. If you add a little bit of freshly squeezed lemon juice, you can preserve them longer if canning. Here are some other great garlic recipes for you to consider: Garlic Cheese Bread, Baked Garlic Potato Wedges, and Spinach Artichoke Dip with roasted garlic. Roasted garlic is rich flavor and used in cooking as a sweeter, less pungent, version of its raw garlic form. Line a rimmed baking sheet with parchment paper, silicon mat, or foil. Spread the unpeeled garlic cloves in a single layer on top of the baking sheet and drizzle with just enough olive oil (approximately 2 tablespoons) so all the garlic cloves are coated. Lightly season the garlic cloves with kosher salt pepper. Roast garlic for 45-60 minutes, gently shaking the pan half way through. The roasted garlic cloves are finished roasting when they are fork tender and golden brown. Add the roasted garlic to an airtight container or jar. Fill the container with olive oil and store in the refrigerator. Roasted garlic will last up to 2 weeks in the refrigerator. 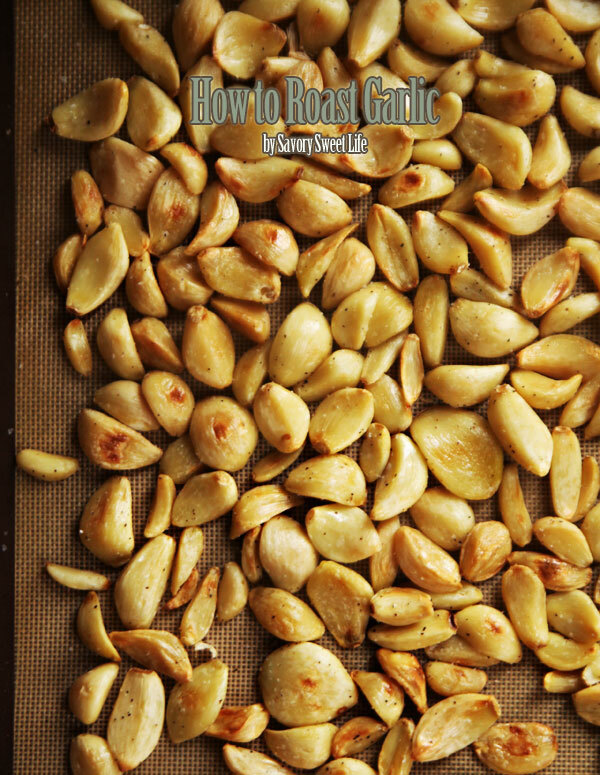 To freeze the roasted garlic, place individual roasted garlic cloves in a single layer. Freeze the garlic for 1 hour and transfer to a sealed bag or container. Frozen roasted garlic cloves will keep for up to a month. You can also mash or puree the roasted garlic and store them in ice cube trays to add to sauces or to make dishes such as roasted garlic mashed potatoes. Take your ‘Roasted Garlic’ to the next level. I pour in a couple of large Handfuls of Peeled Garlic into a 2 Qt baking dish and cover with Extra Virgin Olive Oil and bake @ 325° for 25 min. Remove and add a Tsp of your Favorite Salt, I prefer Pink Himalayan. Also, add a 1/2 Tsp of Crushed Red Pepper Flakes and the Juice from 3 Small Limes. Stir and place back in the oven for 20-25 Minutes. Remove and allow to cool down for a few minutes and then add a nice heaping Tbsp of Crushed Greek Oregano and/or Chimichurri, stir and then grab your Old-fashioned ‘Wafflehead’ Potato Masher and mash all this beautiful, flavor-filled Garlic together until it looks like Tapioca Pudding. Now spoon this entire batch into a WIDE-Mouthed Jar and refrigerate. I keep a Jar of this in the Refrigerator at ALL times. This will keep for quite some time. I use this for Soups, Pasta dishes, Stir Frys, Saute Shrimp and on and on and on! PURE FLAVOR!!!! I love elephant garlic! One year I bought a head to plant but for whatever reason it died. This post just saved me so much time for my next batch. I just spent 2 hours roasting and preparing it the old way for a large batch of garlic butter and I’m not even done yet. Cutting the tops off, individually wrapping 3 lbs of garlic heads , roasting, squeezing then pureeing is VERY time consuming and NOT easy on my hands. I am definately trying it your way next time. Thank you.